Norway is located in the Central European Time zone (UTC +1), the same as Germany, Sweden, France, Poland, Italy, etc. From the last weekend of March to the last weekend of October clocks are set to Daylight Saving Time – Summer Time (UTC +2). While this doesn’t affect the length of the day per-say, it does have one important effect: the Midnight Sun is not actually at midnight, but rather at 01:00. Due to Lofoten’s position north of the Arctic Circle, sunrise and sunset times, as well as the sun’s position upon the horizon, have a much greater variation than at locations with more moderate latitudes. From the first days of January to the last week of May, the sun’s crossing of the horizon will just about circle the entire compass from south to north. As the weeks pass from July to December, the cycles reverses itself until the sun once again disappears into the waters of the Vestfjord to the south. For those of you visiting Lofoten for the first time, you will be amazed at how quickly the days lengthen or shorten as the weeks pass by. From January to May, the day lengthens by about 1 hour per week. And Conversely, from July to December, the days shorten by about 1 hour per week. That is over 4 hours of daylight gained or lost per month. Or, to say it a different way, the sunrise on May 1st is over two hours earlier than the sunrise of April 1st. Don’t forget to change your alarm clock every few days, really. It may not be something you’ve really paid attention to before, but for the photographer on Lofoten, I think it’s important that you make a general note of where the sun will be throughout your visit to the islands. 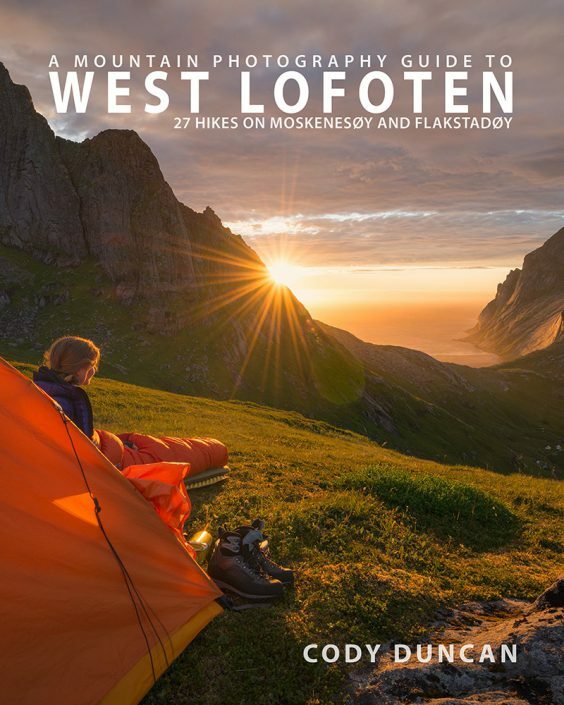 This is also of greater importance on Lofoten due to the mountainous nature of the islands, where many locations may not receive any direct sunlight at certain times of the year due to the position of the sun. For example, one of my favorite sunset locations in early winter is at the coastal cliffs just beyond the village of Å. In the first weeks of February, this is a perfect location as the sun sets just behind the ‘end’ of Lofoten, with good possibilities for some dramatic light. Come here in April, or even the middle of March, and the sun is now setting too far to the west and behind the mountains. Or take Kvalvika beach. In the first week of May, the sun sets into the sea straight out from the beach. Just 3 weeks later, however, the sun will now be concealed by the mountains on the right of the beach, meaning you’ll have to change positions if you want to see the sun. A helpful free online resource for calculating both sunrise/sunset times and positions is the NOAA Solar Calculator.